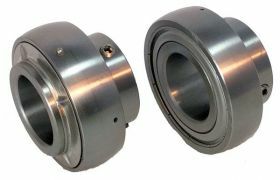 The limiting speed of any ball bearing insert is, for practical purposes, determined by the quality of fit between the inner ring and the shaft. The 2 setscrews should be tightened to the appropriate torque figure. Over tightening may result in a fracture developing in the inner ring. Should the axial load be high, a small dimple in the shaft may improve the locking effect, but beware of introducing unwanted stress concentration factors. For best axial load carrying capacity the bearings should be mounted against a shoulder in the shaft. QCB® Stainless Steel bearing units are made in high quality stainless steel for maximum corrosion resistance. All pillow blocks and flange units have a solid base and smooth exterior surface restrict the growth of bacteria. Need some advice? We can help!